Augmented reality surgery and virtual reality surgery are terms that will become more commonplace in the medical industry as advances in computer assisted operations move forward. And the Thai healthcare industry isn’t being left behind. 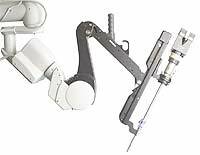 Recently the first robotic sugery in Thailand was performed, a prostrate cancer operation at Bangkok Hospital using the Da Vinci laporoscopic robot. Laporoscopic surgery is the use of a small camera and tools inserted into the body through a small incision. Advanced systems allow the use of many specialized tools to perform complex operations. Key to making this type of surgery viable is advanced imaging, so-called augmented reality surgery, where the view of the patient is augmented by MRI (magnetic resonance imaging) scans so that doctors can see in real time what is diseased and what is healthy, and then guide the robot during the operation. This entry was posted on Wednesday, February 28th, 2007 at 1:03 pm	and is filed under Medical Tourism News, Surgery. You can follow any responses to this entry through the RSS 2.0 feed. Both comments and pings are currently closed.